Orange chocolate fudge is the perfect treat for Christmas. Just 4 ingredients and 7 minutes is all you need to make this dreamy treat your reality. 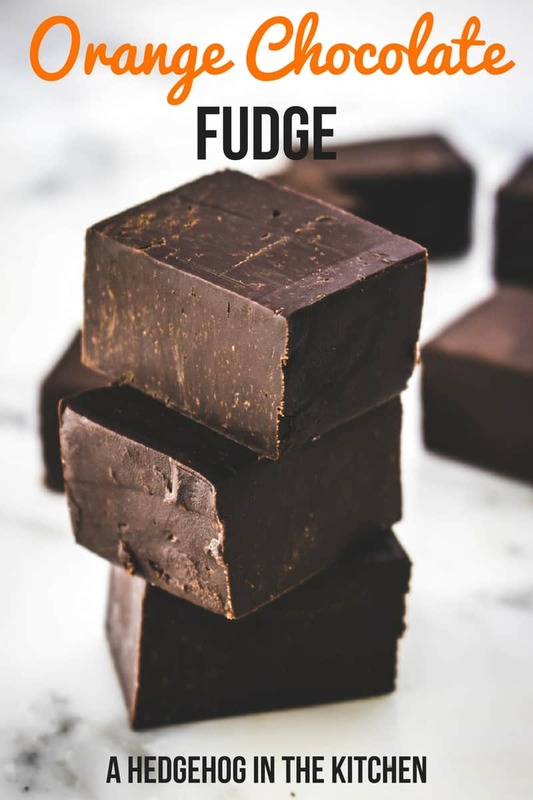 Sweet, creamy chocolate fudge with a hint of orange. 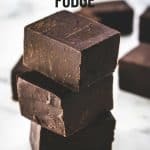 This chocolate orange fudge recipe is a delicious twist on a classic fudge. Follow my tips below when making this recipe. 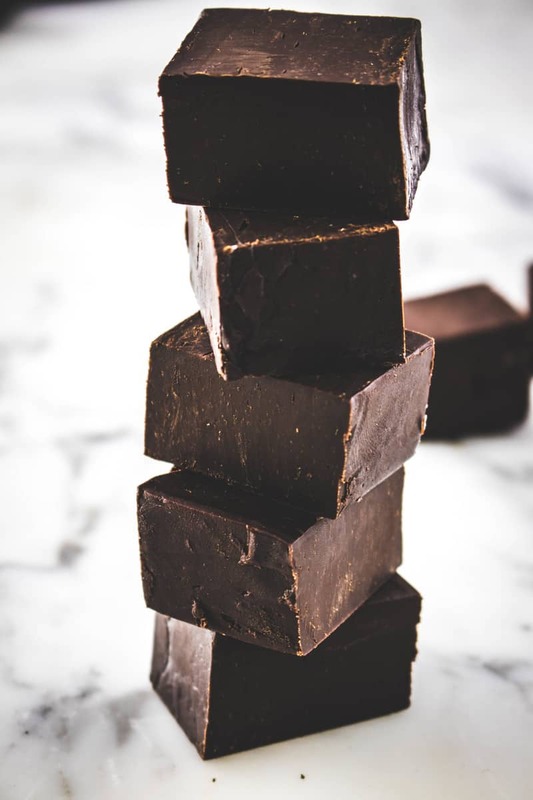 To make this orange chocolate fudge, all you will need are these 4 tasty ingredients: dark chocolate, sweetened condensed milk, the zest of 1 ripe orange, and butter. That’s it. 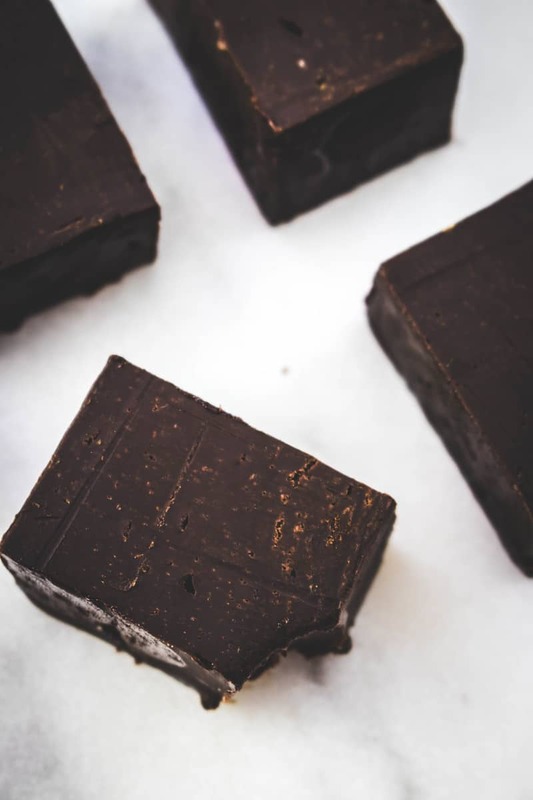 This tasty chocolate recipe is the delicious result of our trip to Edinburgh and all of the fudge we ate along the way. Our trip to Edinburgh looked something like this: arrive, check-in to our swanky hotel, try fudge for the first time, fall in love with said fudge, eat fudge for the rest of our trip… You get the picture! It was really fun and we highly recommend you take a trip there one day if you get the chance. What was it about the fudge that made us fall in love during our stay in Edinburgh anyway? It was all perfect – which is why we absolutely recommend traveling to eat. Check out this post about eating our way through Tuscany to see what I mean. This recipe is super simple recipe, but here are a few tips. Use low heat so it doesn’t chocolate orange fudge doesn’t burn. Butter your dish well or line with parchment paper so it is easy to remove. Put the ingredients in a pan and put over low heat. Whisk with a wooden spoon until the mixture melts and combines. Pour into a bottomless buttered mold and refrigerate for an hour. Remove from the fridge and cut into 12 rectangular pieces. Christmas gift for your kids’ teachers? Perfect. Looking for a stocking stuffer idea that everyone will love? Done. Think it’s so sweet to give homemade, edible Christmas gifts but hate spending hours making Christmas cookies? Problem solved. Looking for a romantic treat to share with your husband in bed on Christmas morning? Look no further. Looking for more tasty Christmas cheer? We’ve got you covered with these recipes! Orange chocolate fudge is the perfect treat for Christmas. Just 4 ingredients and 7 minutes is all you need to make this dreamy treat your reality. Put the ingredients in a pan and heat on low heat.